It has been a while since I have posted, a couple weeks. Some really wonderful things have been happening with my pottery, while simultaneously I have been pulled many different directions; making it hard to accomplish all that I would like. I made several new sales through the Creatively Maine Pop-Up shop that I am part of, which is wonderful. It was spurred by my decision to start a sale at the shop - 20% off for the rest of the time that my items were at the shop (through the end of the month until the shop closes). I started that back almost 3 weeks ago, so it has helped with sales, which is always the goal! The big news from the shop is that I received two custom orders. One individual who wants a set - 4 plates, 4 bowls, 4 mugs. The other would like 4 plates and 4 bowls. I am SUPER excited about these orders, because they are the first large orders I have received. I am nervous about these orders, because they are large, and because I am still learning with my throwing and being able to produce items that are the same shape and size - that is HARD. I have made the 8 bowls, and have them in the kiln as we speak with the glaze firing. I have the plates and mugs drying and readying for the bisque firing tomorrow, and then plan to do glaze firings over the weekend into monday. My worry is that I underestimated how much clay I would need, and am currently completely out of clay. I have some on the way, but at this point it is too late for it to be helpful for me to get pieces done by the identified deadline. So if any of the pieces have an issue... then I do not know what to do. So cross your fingers that things go great! 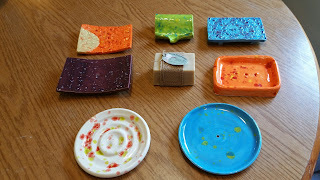 :) The other struggle was that I was given a short time frame (in the pottery world at least) where I had to make, dry, bisque fire, glaze, and then glaze fire all these 20 pieces in just over a 2 week span. So needless to say, the combination of the time crunch, my internal worry over the pieces being "similar" enough, and the reality that I am transitioning back to work full time next week (and have had to work 1 - 3 days a week for the past 3 weeks leading up to school starting) has left me stressed. Regardless, I am hopeful that everything will come out well, and that the individuals who placed the orders will be happy and will see that even if the pieces are not exactly the same size that they were at least made with my full heart and soul and intent. I did an event over this past weekend and sold some pottery. It was not a craft fair, but a local event that was not geared at crafts, so I was happy that I did have some sales (even though I would have loved more). My goal once I have my custom orders taken care of, and once I have everything back from the pop - up shop (Which closes a week from today) is to put all my items back on Etsy, and then to start researching what craft Fairs I can be part of this fall/winter to make some sales going into the holiday season. I feel like I am more likely to make sales at craft fairs because I feel like people might buy my items as gifts for others. My goal over the next couple of months is to really narrow down my focus on a couple select items - people really want mugs, in particular LARGE mugs. So i am going to work on making a bunch of variations of large mugs. I have also sold every chip n' dip platter that I have made, so I need to make some more of those. Beyond that, I will have to think about identifying a couple other options/key items to focus on as the fall approaches. A worry I have is that I am headed back to work next week. I have been lucky to have the summer off to be so active with pottery. But it is time, and school is calling, and I start working with students again starting next week. Tomorrow is my official last day "off" of summer. But overall, I Cannot complain, it has been a great one :) But I do hope that me transitioning back to work does not lead to me not throwing or creating art; I think it will just have to be a balancing process.